The classic "Schoolhouse" shade, a popular choice for schools and work place lighting from 1900 -1940, is still a favorite today. Our petite version (ideal for closets and kitchen pendants) is made of glossy opal glass, hand-blown in the traditional method. 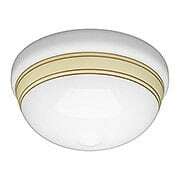 Choose from a variety of sizes to coordinate fixtures throughout your home or business. 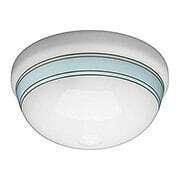 Our 8 1/2-Inch Schoolhouse Shade (4-Inch Fitter) features hand-blown, opal glass in a classic shape. Striking and versatile, it is ideal for a variety of fixtures, including sconces, pendants, and ceiling and porch lights. 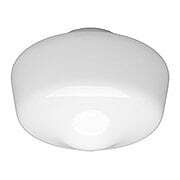 Our 9-Inch Schoolhouse Shade (4-Inch Fitter) features hand-blown, opal glass in a classic shape. Striking and versatile, it is ideal for a variety of fixtures, including sconces, pendants, and ceiling and porch lights. Our 10-Inch Schoolhouse Shade (4-Inch Fitter) features hand-blown, opal glass in a classic shape. Striking and versatile, it is ideal for a variety of fixtures, including sconces, pendants, and ceiling and porch lights. The classic "Schoolhouse" shade, a popular choice for school and work place lighting from 1900 -1940, is still a favorite today. 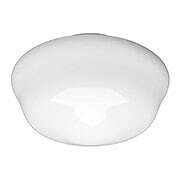 Ours is made of glossy opal glass, hand-blown in the USA. Choose from a variety of sizes to coordinate pendants and ceiling lights throughout your home or business. The classic ball shape shade has been a favorite since the Victorian era, but is equally at home with Mid-Century or Modern decor. 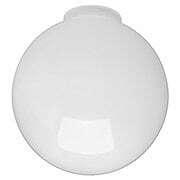 Made in the USA, this 6" diameter shade is hand-blown in glossy opal glass. 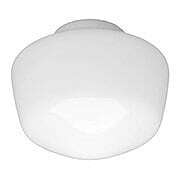 Ideal for pendants, ceiling mounts and porch lights! The classic ball shape shade has been a favorite since the Victorian era, but is equally at home in mid-century or modern decor. Hand blown in the USA, this 7" diameter shade features a sand blasted interior and a glossy outer finish. 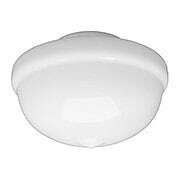 Ideal for pendants, ceiling mounts and porch lights! The classic ball shape shade has been a favorite since the Victorian era, but is equally at home in mid-century or modern decor. 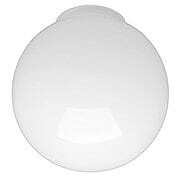 Hand blown in the USA, this 8" diameter shade features a sand blasted interior and a glossy outer finish. 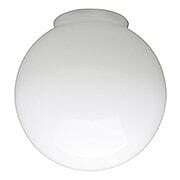 Ideal for pendants, ceiling mounts and porch lights! This round ball shade is a sophisticated addition to your Victorian, Arts & Crafts, or mid-century interior. With a sandblasted interior to soften glare and a glossy finish, this glass adds the perfect dimensionality to all pendants, sconces, and flush ceiling fixtures. Glossy hand blown opal glass is styled in the perfect globe shape, suggesting a rich Victorian influence with versatility for more modern interiors. In a classic shape with a defining banded rim, this hand blown opal glass is ideal for pendants and flush ceiling fixtures. Striking and versatile, the style evokes a vintage Arts & Crafts influence while complementing modern interiors. Our unusual schoolhouse shade with projecting band around the top. 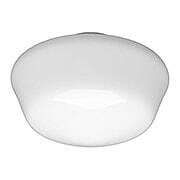 Hand blown in the USA, the opal glass has a glossy finish. A classic look that can be used in any room and any style of décor. 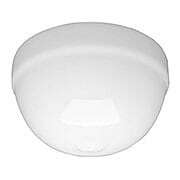 Ideal for pendant and flush ceiling fixtures. This classic "schoolhouse" shade adds a splash of color to your kitchen, bedroom or bath. It features contrasting bands of tan and brown, precision painted for a crisp and lively effect. Made of glossy opal glass, hand-blown in the USA. This classic "schoolhouse" shade adds a splash of color to your kitchen, bedroom or bath. 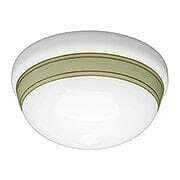 It features contrasting bands of green and brown, precision painted for a crisp and lively effect. 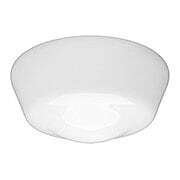 Made of glossy opal glass, hand-blown in the USA. This classic "schoolhouse" shade adds a splash of color to your kitchen, bedroom or bath. It features contrasting bands of blue and brown, precision painted for a crisp and lively effect. Made of glossy opal glass, hand-blown in the USA. The timeless simplicity of this "mushroom" shade design complements any style of home, from late Victorian to Mid-Century Modern. 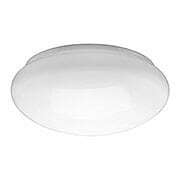 Made of high quality glossy opal glass, it has a nice sheen and coordinates well with schoolhouse type shades. 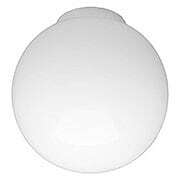 This shade is ideal for large fitter ceiling fixtures, panlights, and bowl chandeliers.